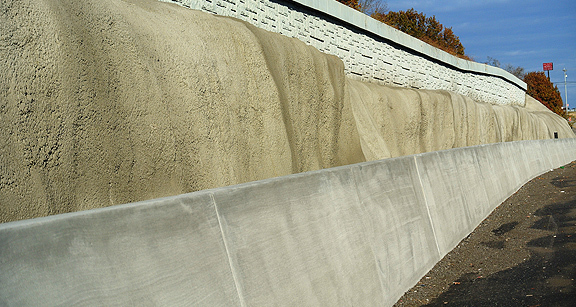 Project obstacles and solutions: United Structural Systems was contracted by the Tennessee Department of Transportation to apply a Gunnite concrete mix along the I-40 widening project in Mount Juliet, TN. The Gunnite mix is used as an erosion barrier. It is delivered to the construction site as a dry mix. USS added water and pneumatically sprayed it into place. The high velocity in which Gunnite is applied makes it very dense and virtually impervious to water. TDOT specified a Gunnite mix to be applied to the bluffs that run parallel to I-40. However, the approved mix for this application would not pump due to the specified aggregate gradation. IMI QC/QA worked with USS to come up with a new mix. They tested it and found it to work well with their spray equipment. Since this was a highway project, the next hurdle was to get the workable mix approved by TDOT. IMI and USS met with TDOT officials. After several meetings, TDOT engineers granted approval of the new mix and USS completed the Gunnite spray process.